Lake Michigan on Jan. 29, 2014; frozen to the horizon! A gorgeous (and dangerously cold!) afternoon on the shore of Lake Michigan. I haven’t seen the lake freeze like this since 1997. It used to freeze every winter in past decades, but it rarely happens now as a result of global climate change. Unfortunately, this is one reason why the lakes are shrinking; without ice, more water is allowed to evaporate. Click on the picture to see some other shots taken on the same day. 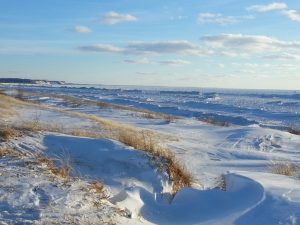 This entry was posted in News and tagged Climate Change, Great Lakes, Lake Michigan by WSCC Faculty Net Admin. Bookmark the permalink.